Sexual harassment allegations involving a principal had the Metro School Board meeting behind closed doors. Employees at a Nashville middle school were concerned about more than just allegations of sexual harassment, NewsChannel has learned. Internal investigations from John F. Kennedy Middle School reveal several employees were also worried about how the executive principal, Dr. Sam Braden, was spending the school's money. Despite those concerns, Metro Schools appears to have done nothing. "Someone from the audit department needs to come do an audit from the past 5 years," the JFK bookkeeper told a Human Resources investigator. She claimed there have been "events catered from our school funding." She added, "There was an incident that Braden says it was going to be off the books. He was given approximately $160 and mysteriously he lost the money." In tweets, Metro Schools Director Dr. Shawn Joseph has praised Braden for doing "amazing work." Joseph posted photos of Braden with Tyese Hunter, the head of the school board's budget committee. Braden later faced accusation from a school employee of being sexually harassed by the JFK principal. The plea from the bookkeeper for an audit was contained in the HR files related to a Metro Schools investigation of those allegations. Two employees also describe money being collected after the death of the school resource officer's father. Among the items purchased: a gift card to Ruth Chris steakhouse. The employees say they saw it in Braden's hands. 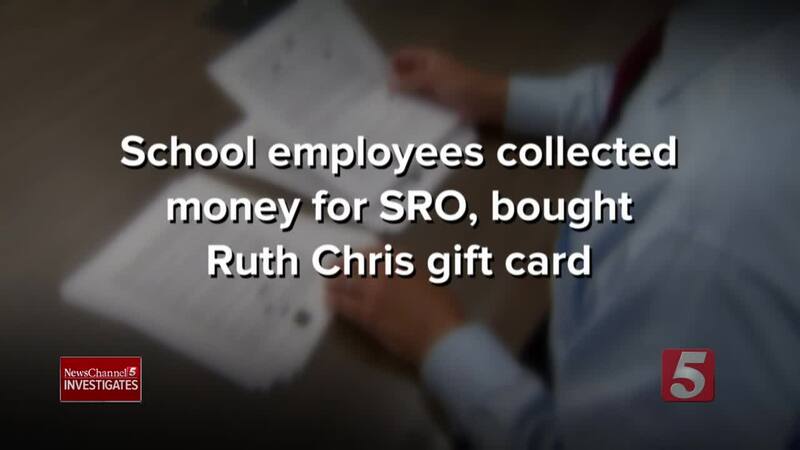 But the officer told investigators his co-workers "were mad" when he told them he never actually got a gift card from Ruth Chris. An assistant principal even kept a journal about Braden's conduct. "Took up money from teachers for (dean of students') birthday. Used that money to buy lunch for office staff." "Stole cookies meant for Beta Club." "Saw (custodian) putting school purchased cases of water in Braden's car." Still, Dr. Joseph's team ignored the school bookkeeper's plea for an audit. A spokesperson told NewsChannel 5 Investigates, "Unfortunately, we were unable substantiate those allegations, which did not result in an internal audit." Braden declined our request for an interview. The files show he denied taking any gift cards, but he was not asked about some of the other allegations. It's not clear how Metro Schools could settled the question of whether his expenditures were proper or not without an audit.